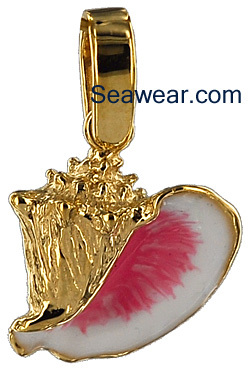 "Where can I buy a pink conch jewelry charm?" Colors will vary as each is done by hand, by a different artist who sees the subtle hues of Florida Conch or the vibrant pink colors of the Caribbean! Picture color will vary depending on lighting, contrast and your monitor. These are very low 72dpi resolution photos. 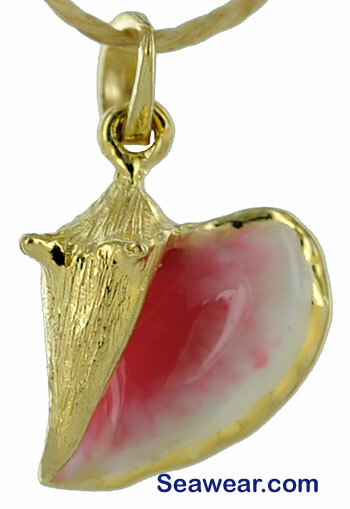 Small 14kt conch shell with hand applied enamel glaze, the back is flat and smooth. One half inch plus loop and bail. Charm or pendant with the edges diamond cut. 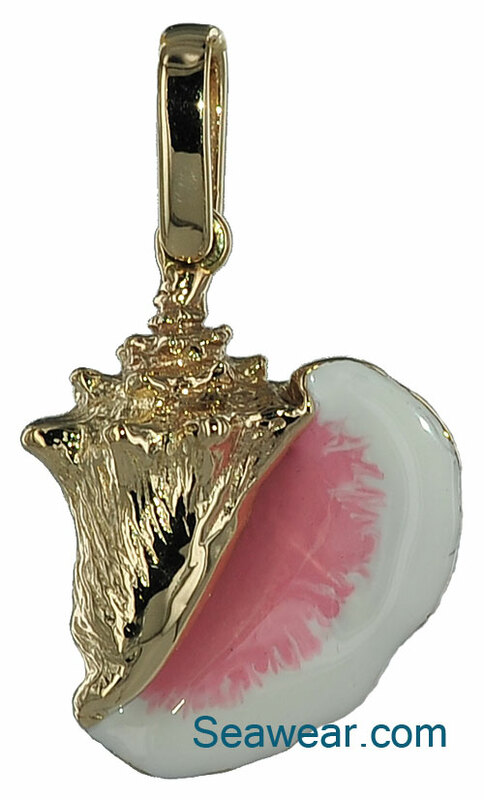 Small baby conch with gold rimmed lip. Hand made 1/2 inch tall app 1.9gms 3D fully dimensional round. 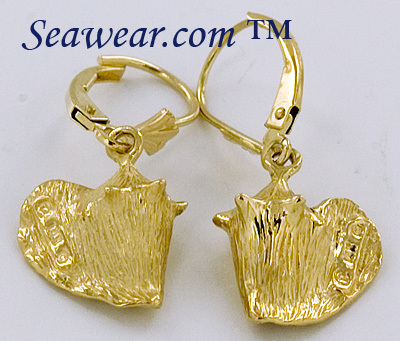 14k and enamel whelk shells finished on the front with hollowed back for lower cost. Three sizes to choose from 1 1/8"; 1" and 3/4"
If you buy her just one, this is it! The jumbo Queen Conch with enameled paint. These were custom made with extra large bail for omega or chain. Bail opening is 6x13mm. Across the front is 1 1/8" and 1 3/8" tall plus bail, thickness is 3/4" Total hanging length with bail is 1 7/8" Weight is 23.4gms Can take eight weeks when not in stock. 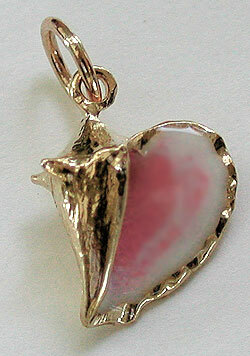 14kt conch with hand applied enamel, pink tones, muted, 3/4" tall, heavy requires strong chain, 3D finished on all sides. Small enameled queen conch with porcelained colors. 1/2" or 13mm tall and wide. 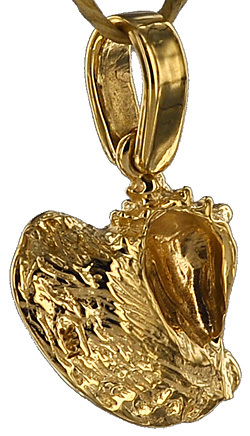 Beautiful small charm or pendant, full round 3d app 2gms. 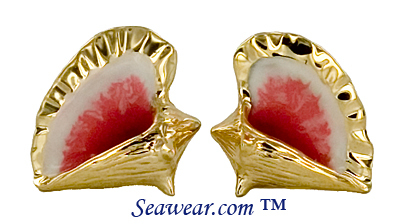 14kt enamel conch earrings with flat hollowed back for lightness on the ears dangle from ball drop posts. 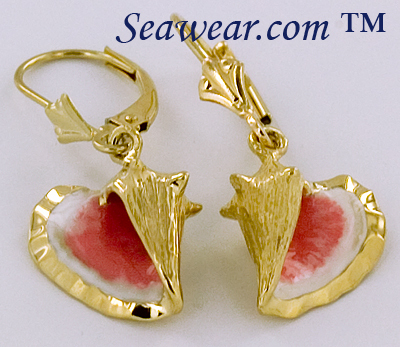 Baby enamel conch leverback earrings. Total dangle is 1 1/8", almost 1/2 wide, app 4.4gms. Full round finished on all sides. 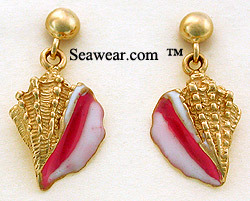 Larger enamel conch earrings with stud post. Smooth comfort back is highly polished. 3/4" tall or 19mm and app 5.4gms per pair. 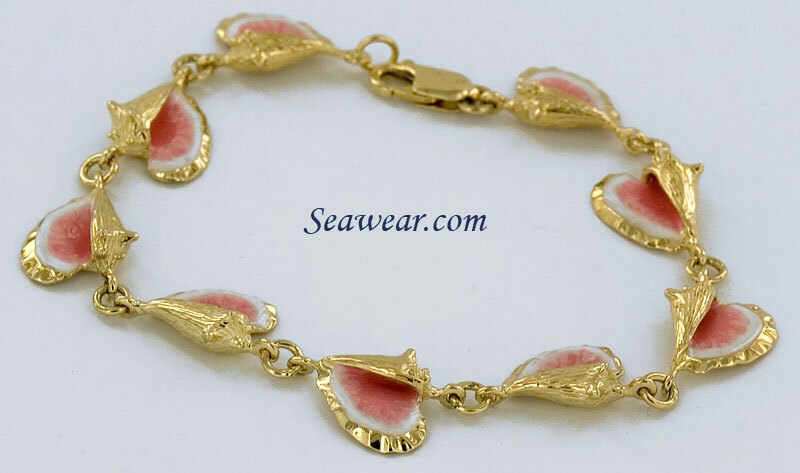 Ceramic style enamel glaze over 14kt gold gold, nine conchs to make up 7.25" and 15.9gm bracelet that will be noticed! Conchs are finished and textured on back side. 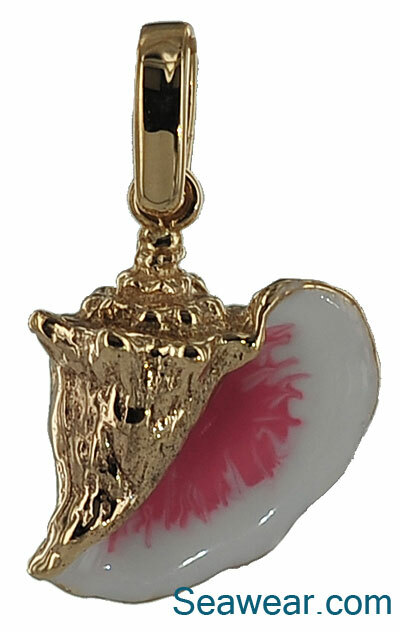 Each conch is individually painted by hand, unique and no two are alike. Each conch is approximately 1/2" and 1/2" tall. 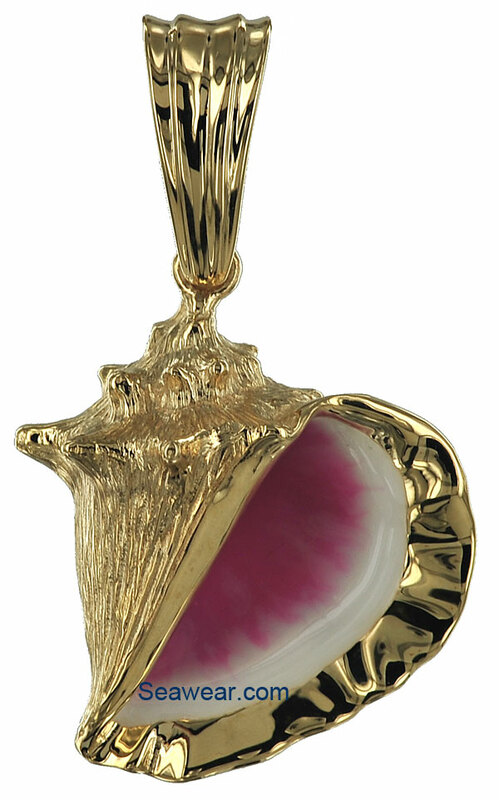 Enamel conch bracelet with larger heavy conch shells, 7.5 inch length and 38.8gms! Each shell is nearly one inch long and 3/4 inch wide and full round finished front and back. 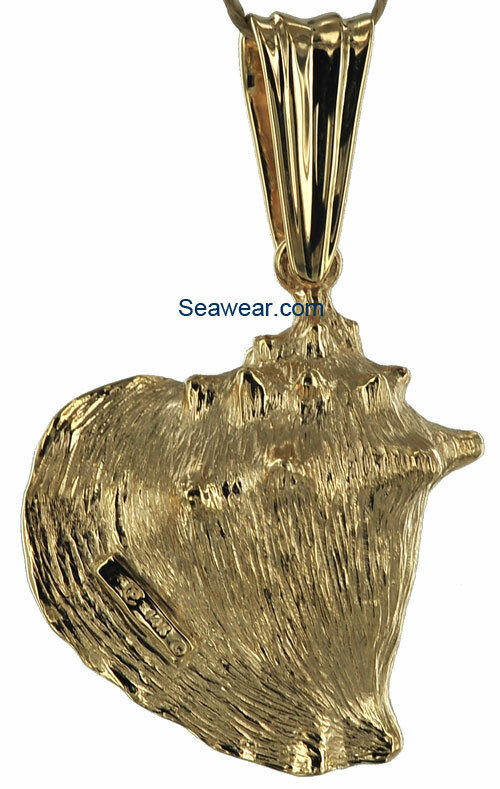 Photo is the actual item, heavy links, larger lobster claw clasp, all solid 14kt gold with ceramic style enamel, edges have ocean wave edges so you can hear the sea wherever you travel. For that very special event of her life. 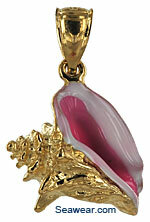 Enamel conch bracelet in 8", approximately 19gms. 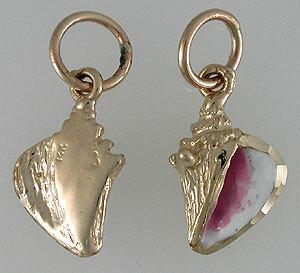 These are larger conchs at 5/8" wide and 1" long at links. The back side is flat for comfort and slightly scooped out to make it lighter. One less link would be just under 7". The edges are scalloped for extra sparkle!